In Kerblam! there is an interesting story struggling to free itself from a deeply flawed episode. The Doctor Who team is transparently panning Amazon while exploring modern automation and the role of humans in the face of ever-improving technology. Doctor Who has worked with these ideas before, but in this case where is the tension or the danger? Like so much of Season 11, the characters seemed to be sleep-walking their way through the story, and the interesting possibilities are buried under layers of ..er?.. cotton balls is the best analogy that came to mind. At the outset we see a "teleport signal" enter the TARDIS somehow. But this breaks all previously established attributes of the TARDIS. In all of the previous Doctor Who episodes we are told the TARDIS is impregnable. Except, that is, for extraordinary forces. For example in the Key To Time season the White Guardian and Black Guardian repeatedly entered the TARDIS, but they are eternal beings of great power. Or in another Tom Baker story, The Pyramids of Mars, the story starts with an intrusion by the ancient god-like creature which was the protagonist, and The Doctor exclaiming that the TARDIS is impregnable but for a being of great power (see https://www.youtube.com/watch?v=3tyBYzeIJjI). There are numerous examples in Doctor Who that the TARDIS is impregnable except for extraordinary forces. Yet, we are supposed to believe a space-based Amazon-clone delivery robot could enter the TARDIS? Really? Okay -- it was necessary for the story -- that some information must arrive in the TARDIS to draw The Doctor and crew to Kerblam&apos;s HQ. But is the plot device worth breaking decades of canon? The plot device did more than just draw the TARDIS crew to Kerblam HQ, it also served as a Chekov&apos;s Gun device as well. The bubble wrap, the innocent little thing of bubble wrap, turned out to have been weaponized. 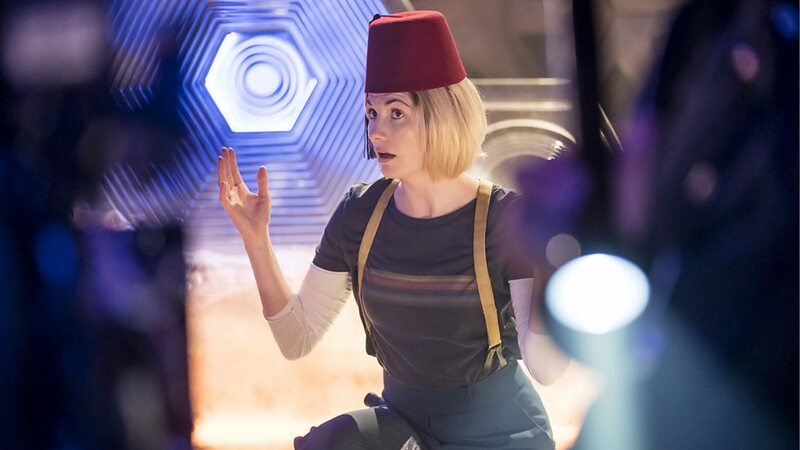 And did they really need to bring back the Fez? No, Doctor, Fez&apos;s are not cool. Oh, right, I&apos;ve gotten lost in distractions. An element of Doctor Who from the beginning is that the characters get into serious danger, and have to work their way out. In the old school 4-episode format (a story would be told over 4 weeks, at 20 minutes of aired show per week) at the end of each episode the situation would grow ever more dire. The basic scenario would be told in the first episode, by the end of the second episode all heck is breaking loose, and by the end of the third episode it looks like the Doctor may be killed or something. In modern Doctor Who the stories are told within the confines of one episode (sometimes two) but the same arrangement is followed. The show is split into 15 minute increments, with ever-more-dire circumstances by each 15 minute mark, and then a stunningly brilliant conclusion. The key is - the characters are in grave circumstances throughout the episode, with growing danger all along the way. In Kerblam! we have none of that. The circumstances seem non-threatening except in the abstract. Yes the robots were scary but not really. Yes the conveyor belt ride could have had some tension but it didn&apos;t. Yes the bubble wrap was meant to be ultra scary, but it wasn&apos;t. And where was the usual tension between The Doctor and the Authorities? In a normal Doctor Who the boss-man of the factory would have been the villain. Or perhaps he would be revealed to be working for some interstellar arch villain of some kind. An example is the Jagrafess in The Long Game. Instead in this case the boss-man isn&apos;t the villain, but has been trying to work out the problem himself. A twist that even confuses The Doctor. Another norm in Doctor Who is the evil computer bent on destroying humanity or something. For example WOTAN in the 1st Doctor story The War Machines, or B.O.S.S. in The Green Death and plenty of other examples. Instead, in this case it was "The System" which detected the problem and reached out to The Doctor for help. Another norm of Doctor Who is suspicious Authorities trying to thwart The Doctor and his/her companions. In this case the Authorities seemed to just roll over and accept The Doctor and Companions without question. On the one hand the impregnability of the TARDIS is a norm which was broken, and I&apos;m crying foul. But the other broken norms seem like a good thing that raise interesting story points. The TARDIS is supposed to be impregnable ... that is its duty, to be an impregnable thing in its own right. To invade the TARDIS on whimsy is strange. For example you could argue when the Titanic broke into the TARDIS at the beginning of The Runaway Bride, it was because of the psychic force of the DoctorDonna. But is there anything like that for the Kerblam delivery robot? Nope. The other broken norms do help the story in some ways while not breaking anything important. Sometimes it is useful to flip formula&apos;s on their head. There was an amazing amount of references to Amazon and current controversies about Amazon. For example, Amazon has algorithms constantly watching employee performance and the algorithms will punish people who are underperforming. Another example is the level of automation at Amazon warehouses. The actual automation TODAY at Amazon warehouses is beyond what is shown in the episode. The episode shows workers trundling carts around dimly lit warehouse shelving where in reality Amazon warehouses have robots that move the shelving over to the location of humans who are assembling the packages. And yes there are places in Amazon warehouses that humans do not enter, because the robots are moving shelves around at such speed it is dangerous.